Joanna Patricia Kintanar Cariño: I am an activist for indigenous people's rights, not a terrorist. I am an activist for indigenous people's rights, not a terrorist. I have been informed that my name is included in the list of some 600+ persons that the Duterte regime has tagged in its petition to proscribe the Communist Party of the Philippines and the New People's Army as terrorist organizations. 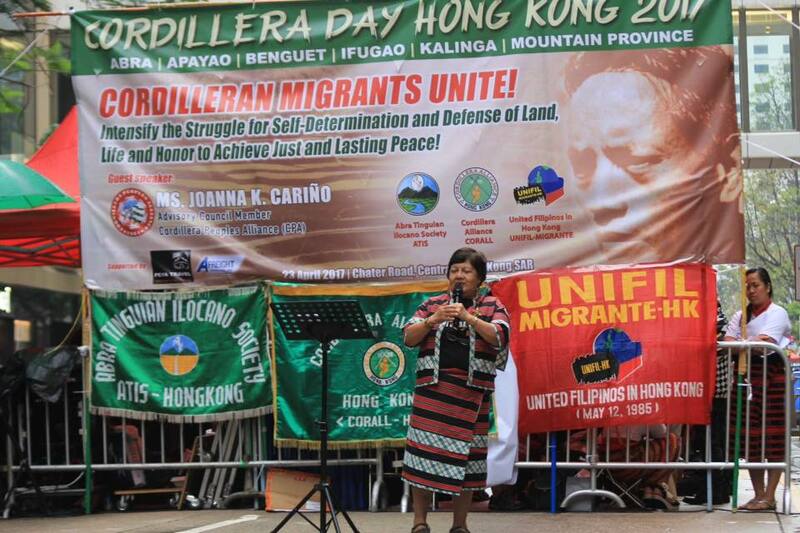 I helped found the Cordillera People's Alliance in 1984 and have served as its treasurer, secretary-general, convenor of its International Solidarity Commission, then of its Research Commission, through the years since its founding. I presently sit on the CPA's Advisory Council and am co-chair of SANDUGO, the national alliance of Moro and Indigenous Peoples for Self-Determination and a Just Peace. It is alarming and a serious threat to my security and those of other CPA personalities past and present to be included in such a "terrorist" list. The Cordillera People's Alliance, to which I have devoted the best years of my life, is a legal, democratic organization with a public record of defense for indigenous people's rights to ancestral land and self-determination. Yet, several of CPA's leaders, past and present, are now included in the "terrorist" list, including Vicky Tauli-corpuz, the UN Special Rapporteur for Indigenous People's Rights; Joan Carling - former secretary-general of the Asia Indigenous Peoples Pact and now the international focal person for the IP Major Group in the Sustainable Development Goals; Jose Molintas, human rights lawyer and former Asian representative to the UN's Expert Mechanism on the Rights of Indigenous Peoples; Beverly Longid, international coordinator of the Indigenous Peoples Movement for Self-determination and Liberation; Windel Bolinget, present Chair of CPA; and Jeannette Ribaya Cawiding, former secretary-general of Tongtongan Ti Umili - CPA's urban chapter. This is clearly an attack by this repressive regime on the Cordillera People's Alliance and indigenous rights defenders. Let us speak up to denounce this new scheme to silence legitimate opposition to tyranny and dictatorship!